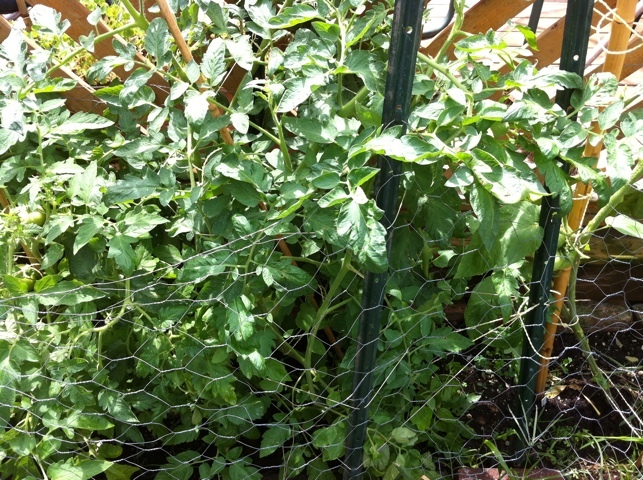 This is the “before” shot of one of my tomato plants before I decided to trim it. Just to the right, you can see an “after” of the brandywine, which I did chop down quite a bit, in honesty, more than I intended. (It has a very bent stem due to late staking — horrifying, I know. But plants are hearty beasts and it’s still giving me hearty fruit .) So I did this pruning one day before sitting next to an experienced gardener who lives down the street. Her sons come to visit two weeks every summer, and the whole nabe ends up there for a beer or two at some point in those two weeks. Her front yard is gorgeously adorned in always bountiful flowers and I’ve heard of the abundant veggies and other fruits and foliage she grows out back. In her heavy Italian accent, she told me, “nooooo, you don’t do dat” when I showed her the before and after pictures of the tomatoes I had cut back the day before. My pruning adventure also occurred one day prior to talking to my friend whose family works 20 acres for local markets in Indiana. In addition to other interesting tidbits about tomatoes (including that the sweetest part is the bottom because the sugar sinks and settles there), she also admonished me (in the friendliest way — she is a Hoosier after all and therefore born into midwestern nice) for my pruning efforts. It was one day before listening to a couple podcasts on tomatoes, where none covered pruning with enough attention for me to think anyone else was doing this. So I thought I was sunk. My before and after should have stayed at “before.” But, then, ta da! The tomato plants seemed to love it. They grew back some branches but wasn’t overrun with them. And my eyes may have been deceiving me but suddenly tomato fruit were springing up where none had been before. Now, having had some additional time to read a little further on the question whether to prune tomato plants, and realizing that the answers are more elegant (is it just me or is that word creeping up everywhere lately – throwing it in to be a member of the bandwagon) than I expected. Having had time to consider all this – the instinct to prune, the tsking of my fellow gardeners, and the happy tomatoes as an end result, I affirmed what I have been discovering all along: it’s good to take in the advice you can get, but your own instinct and experience is your best guide. I recently heard on SSG episode 112 that you can take tomato clippings, put them in water and roots will grow. You can then start new plants. Someone gave my niece a branch off their fig tree. She put the end into a flower pot and now it’s growing new branches, leaves, and even has small figs growing. I’ve had good luck taking a branch of mint, sink a length into soil and before long it’s growing like crazy.